There exists a general lack of biblical understanding for the idea of "testing" that emerges in the Old Testament as a significant theological theme. The faithful from both Old Testament and New Testament times are tested for their faith. This kind of experience often involves enduring hardship and difficult times. While often confused with the biblical idea of "temptation," the biblical idea of testing stems from a metallurgical background and carries a unique covenantal function. Testing will be at the center of how God responds to the rebellion of his people and reveals God's primary concern for the faith of his saints. 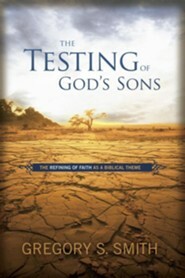 The Testing of God's Sons focuses on the language of testing and explores the semantic range for the idea of testing that draws from both the biblical context, as well as the world of the ancient Near East. This study then focuses on the often overlooked Joseph narrative and its unique contribution to the theology of testing that is presented by the rest of the Pentateuch. Finally, the remainder of the biblical texts are investigated on the theme of testing. The last chapter shows the fact that God tests His sons - Adam, Abraham, Joseph, Moses, Job, Israel and even Christ. It is through the experience of God's tested sons that believers are invited to more fully and deeply understand their own experience of testing. There exists a general lack of biblical understanding for the idea of "testing" that emerges in the Old Testament as a significant theological theme. The faithful from both Old Testament and New Testament times are tested for their faith. This kind of experience often involves enduring hardship and difficult times. While often confused with the biblical idea of "temptation," the biblical idea of testing stems from a metallurgical background and carries a unique covenantal function. Testing will be at the center of how God responds to the rebellion of his people and reveals Gods primary concern for the faith of his saints. Our study will first focus on the language of testing and explore the semantic range for the idea of testing that draws from both the biblical context, as well as the world of the ancient Near East. This study will then focus on the often overlooked Joseph narrative and its unique contribution to the theology of testing that is presented by the rest of the Pentateuch. Finally, the remainder of the biblical texts will be investigated on the theme of testing. The last chapter will appreciate the fact that God tests His sonsAdam, Abraham, Joseph, Moses, Job, Israel and even Christ. It is through the experience of Gods tested sons that believers are invited to more fully and deeply understand their own experience of testing. Gregory S. Smith (Ph.D., The Southern Baptist Theological Seminary) is associate vice president for Academic Administration and assistant professor of Bible at the College at Southwestern Baptist Theological Seminary. He is a contributing author to Mounces Complete Expository Dictionary of Old and New Testament Words (Zondervan). Discuss your general academic background and, more specifically, your work in the biblical text. What would you consider to be your expertise? What might a reader want to know about you personally and professionally regarding your ministry and your research interests? This volume stems from much of the research and "digging" I was doing during my doctoral work. I am not a rocket scientist, but work hard at everything I do. My role here at Southwestern involves both administration and teaching. For example, lately more of my research energy has been diverted to academic technology and helping faculty prepare for the growing challenges of online learning. Practically, I think I have my ear to the ground when it comes to the subject of my book. During the writing of the last chapter, for the entire year, I watched my mom die of cancer. The next year, during the heavy editing phase, my nephew broke his neck during a tragic accident on a spring break trip during his senior year of college. As a quadriplegic and over the next year of his recovery, I helped him finally graduate. It seems that suffering is all around us. People are asking the "Why?" question and I think that the biblical idea of testing, rightly understood, addresses this question and helps believers understand God's role and purposes a bit more in their experience of testing. Would you classify your volume, The Testing of God's Sons, as exegetical or "big picture"; a reflection of biblical or systematic theology? How would you succinctly define your methodology? The book attempts to develop a biblical theology of a single theme. It begins by exploring the language and concepts used to discuss testing in both biblical and extra-biblical contexts. In the appendix, I spend a bit more time exploring a unique Hebrew term for testing and the metallurgical idea of the "touchstone." From this, I move to the Joseph narrative and develop the biblical theme of testing there. After that, I move through the entire Old Testament and follow the biblical discussion of testing. Finally, I explore the New Testament's discussion of testing. Can you articulate a core thesis that is woven throughout the volume and brings cohesion to the book? God is primarily concerned with the refining and authentication of the faith of both His sons and daughters. The unanimous voice of the biblical authors is that God accomplishes this through a world that is fallen. Thus, hardships, difficulties, sufferings and exile are explained as the means by which God refines our faith. This side of the Cross, we understand that suffering with Christ leads to the future experience of being glorified with Him as well. Thus, believers who experience testing through suffering can be encouraged with the future satisfaction of knowing that they are contributing something of great and eternal value. Briefly describe what you mean by the phrase "Covenant Good as Functional Good." Part of my intent here was to explore the Hebrew idea of "good" in the context of covenant relationship. Of course, the highpoint is Moses' declaration, "See, I have set before you today life and good, and death and bad" (Deut 30:15, emphasis mine). Life, longevity and blessing in the land (=good) was integrally linked to Israel's covenant response in the land. Moses also offers the patriarchal example of Joseph, "And as for you, you meant evil (bad) against me, but God meant it for good in order to bring about this present result, to preserve many people alive" (Gen 50:20, NASB, emphasis mine). Again, we see the emphasis of good working through bad to establish God's ultimate end. In the ancient world, covenants are made to bring about functional good results. It is interesting to me that Paul refers to the fact that God subjects creation to futility in response to the Fall - Adam's rebellion against God's defined relationship (Rom 8:20). In that same context, Paul also presents the idea of suffering with Christ (v. 17). Thus, while I may have needed to develop it more fully, I do think we have grounds to talk about a world, created by God as good, and thus functioning to bring about the good results ultimately desired by God. What is one of the more surprising truths you discovered during your research of this topic? I was surprised to see how involved God is with the testing of the faithful. There is a consistency that emerges with how testing is developed theologically. The Pentateuch begins with a focus on the individual testing of the Patriarchs. They function as an example of testing for the corporate experience of testing of Israel as a nation. Moses establishes a theology for testing that reflects back on Israel's wilderness experience, and thus serves as the foundation for how the prophets explain Israel's experience of exile for the faithful remnant. Does God use experiences of pain and suffering to both get our attention and drive us towards a deeper faith and trust in Him? The biblical authors share a unanimous affirmation on this point. How do you envision your book being used in both the academy and the church? Similar to what I shared above, I think a proper understanding of testing helps the faithful gain a broader context for their suffering. For example, it can change the way we pray for those who are suffering. While it is not wrong to ask the LORD to take away the source of suffering, testing invites us to ask that the person suffering experience a deeper knowledge of the LORD in the midst of their pain. Further, we can pray that the testimony of faith of the individual suffering be expanded. Finally, we are reminded that through suffering, we share in the suffering of Christ and will ultimately be sharing in His glory in eternity. While it may not pay the bills, mend a broken relationship or restore a body racked by cancer, an understanding of testing does assist one in better understanding the divine vantage point behind the experience of testing through suffering. Is there anything you would have liked to include that you were unable to include due to space limitations? Actually, I am thinking of a companion volume that might flesh out more of the practical implications for testing and suffering. This is what has been occupying more of my thinking lately. My pastor has invited me to join him in a sermon series on the topic of my book. I am excited about this as it helps force the issue to the more practical side of things. People all around us are dealing with the sting of living in a fallen world. In a fallen world, there is no neutral position. Pain and suffering aggravates our tendency towards self-reliance. We move towards God or move away - or worse, we find some way of killing the pain. Testing is our guide to understanding a bit of the why, and, offers us satisfaction in knowing that the LORD has the final word to our suffering and pain. I'm the author/artist and I want to review The Testing of God's Sons - eBook.